7 Ways Thrifty People Save Money On Weddings: A $1500 Wedding! When I got engaged in April of 2017, I knew a lot of what I wanted for my wedding. I—like many women—had looked through Pinterest, looked on Facebook, looked in magazines for wedding day-dream inspiration and I knew what I wanted. However, I also knew I didn’t want to spend much money. I graduated college in May 2017 and my fiancé is a college student (he spent eight years in the Marine Corps Reserves before college). 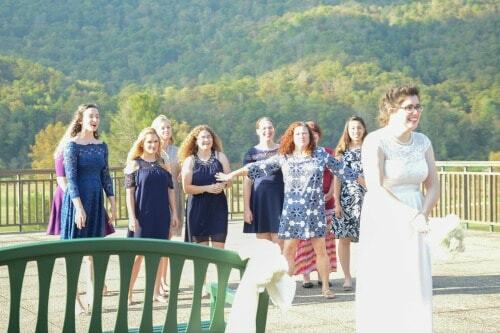 Because I hadn’t been working and he was working around his class schedule, I knew a thrifty wedding would be key, plus I am too practical to want to spend so much money on a dress or venue when we could buy appliances or make a down payment on a house. We got married October 14, 2017, exactly six months after we got engaged, meaning we pulled together a wedding for under $1500 in a rather short amount of time! I know that not everything we did will work out for everyone, but I think several principles of our planning will help others. My husband and I had talked marriage before getting engaged and I looked into wedding options before we sat down to talk budget with my parents, so I was prepared to talk budget realistically. I knew $1500 was a good budget and I also knew that was plausible for where we live. That might vary from person to person. Maybe you’re in a location where $500 is possible. Maybe $1500 is the down payment for the cheapest venue—do some research before you set your budget and be realistic with yourself. We did not exceed our budget in any area. We spent about $1,375.76 from the receipts I’ve checked and what I couldn’t find a receipt for, I cross-checked online to estimate. If anything, our total was lower because I overestimated what I was not sure about. OK, listen: I know you probably want real flowers and several food options and personalized gifts for your wedding party, but you’ll need to pick just a few things to battle hard for. Let everything else be malleable. For instance, I desperately wanted real flowers. I got them from our Food City grocery store for $140 and even though they weren’t the flowers I loved (dahlias and peonies and blue thistle), they were beautiful (giant daisies and spray roses). Compromise is OK in your wedding. I was just as happy with daisies as I would’ve been with dahlias because while I loved how the bouquet looked, the ribbon was wet and it was cold and not exactly fun to hold for so long! I ditched it once we finished our pictures. I also wanted a bright white dress. I love true, crisp white. 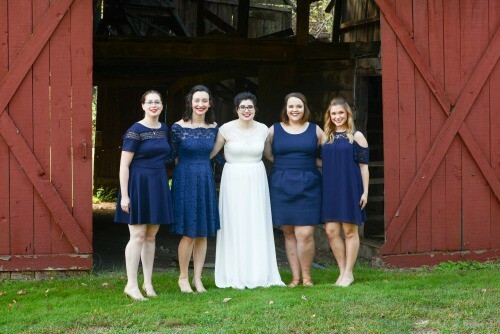 We ordered my dress off Amazon and it fit beautifully and looked amazing—but it was a slightly off-white shade. In the end I wore it because it looked great with the burgundy bejeweled belt my mom made and I felt so comfortable in it—and hey, it was only $45!!! I know that sounds weird, but sometimes wedding “deals” are not great. Sometimes they’re more of a scam because you don’t need the item or they’ve added a “wedding touch” you won’t even notice. My husband and I did a sand ceremony, but when I shopped for supplies at Hobby Lobby, sand and sand-holders were crazy expensive! Sand was $4.99 and the containers were $20+! Instead I wandered from the wedding section to the craft section. I got craft sand for $2.99 and had far more color options, plus it was on sale. Then I found a shadow box frame that was 50% off, making it $10.00, so I made sure the back piece was secure and we used that. It looked great and I loved knowing I got something a little more unique. Hobby Lobby usually runs great floral sales for 40% off and fabric is always marked down. Making boutonnières for groomsmen and family is simple with fake flowers. Could you use discount fabric to drape around your venue for a more classy feel? We also used a Shutterfly prints sale for our wedding invitations. I designed our wedding invitations to fit a 4×6 photo print and got 100 free prints from Shutterfly (my day job includes graphic design, but anyone could do this with an app or basic software). All I paid was shipping costs. Shutterfly and craft stores are the best places to watch for deals on wedding supplies! Their app always offers unlimited free 4×6 and 4×4 prints. Related –The post How To Catch Up On Your Photos Without Breaking The Bank contains all types of ways you can find out about free photo deals. As you plan, think about whether you truly want something or not. We didn’t do wedding favors because we couldn’t afford fancy ones people would keep and I didn’t want to buy cheap ones everyone would toss. As you plan your décor, think through the setup and tear down. Are chair covers or chair decorations necessary if you’re going to take them all down after 20 minutes? Do you have to have intricate centerpieces? Your guests won’t mind if you go simple because simple often means it’s easier on them than trying to see their table-mates over the centerpiece and your cleanup crew won’t have more details to worry about. 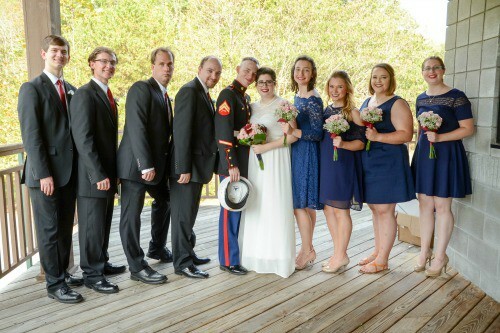 I was blessed with wonderful friends from college and childhood (including Victoria’s oldest son, whom I’ve known for about 15 years) as well as family who helped set up and tear down our wedding. I loved knowing I didn’t have to worry about decorations because my friends and family were out there decorating tables while my bridesmaids and I did pre-ceremony photos. A close friend of mine whom I often babysit for coordinated the actual wedding for us. She managed the rehearsal and day-of events like a seasoned wedding planner. She never let me know a single issue and I felt at ease knowing it was in her hands. She made sure things were done on time, that we all walked in correctly, that I had a bottle of water. I have no idea what all she took care of that day, but I know I would have fallen apart without her. The same woman who was our day-of coordinator threw me a bridal shower. She did an amazing job and I absolutely loved it. She used antique books and quirky cups as vases and we ended up reusing them for the tables at the reception. She also made a garland out of book pages that we used. We put 2-4 stacked books in the center of each square table with a short glass on top that we filled with baby’s breath. It looked great and was super simple—and it was free! We also ended up with free decorations from a wedding held at the same place because we were walking through the venue when they tore down (more on this later). My mom had canvases and paint left over from a painting party and we were able to make cute “extra” decorations from those. 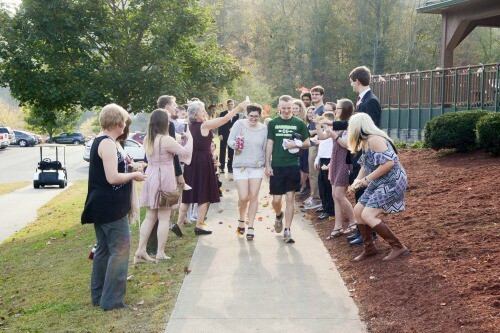 I got wood pallets in fantastic condition from a discount grocery store (they often buy their stock by the pallet) for $5 total and we painted them with the order of ceremony and bridal party, thus replacing programs since most people throw those out anyway. I want to preface this part by telling you I know this won’t happen for everyone. 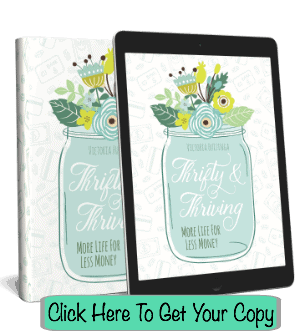 It’s not at all something you can rely on, you’ll have to plan as though it won’t, but my husband and I made a commitment to stick to our budget and we prayed God would help us be wise. We did not let our pride get in the way. We were offered several blessings in the form of friends who run a professional photography business generously doing engagement (we used those for our invitations) and wedding photos free. 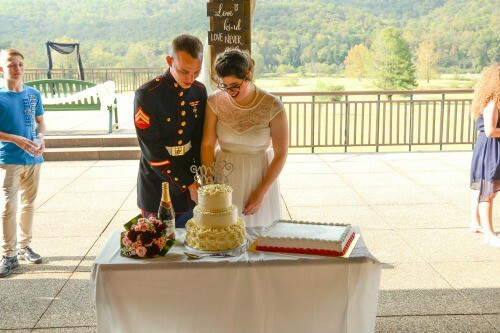 My sister made her gift to us $250 to pay for a wedding cake and a groom’s cake. The most serendipitous experience, however, involved decorations. 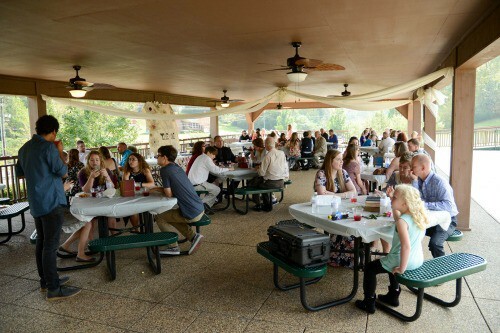 One day about two or three weeks before the wedding, my mom and I drove by the wedding venue (we drive by the golf course to get most places) and we noticed a wedding reception. We were planning to go over there after running errands to walk through the plans for our ceremony and reception with our coordinator. I told mom, “We should offer to help them tear down this evening and see if they’ll give us decorations or sell them to us!” because they were using the same shade of burgundy we were using as one of our colors. Lo and behold while we were walking through our plans and as they were tearing down from their wedding, the mother of the bride graciously offered us most of their decorations for my wedding. We got an amazing backdrop from them as well as ribbon garlands and draping fabric (we later gave those decorations away to someone else as a way of honoring that gift). Because they used them at the same venue, we knew where to put them already. Don’t forget to bless people back! We gave away the decorations after we used them and we gave our photographer and his wife a gift certificate to their favorite restaurant. 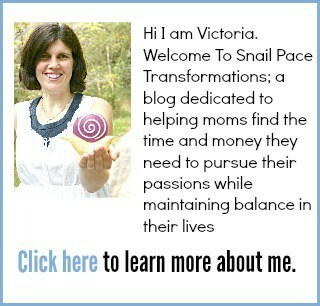 If you can’t afford to do that, you could bake them a special treat or have them over for dinner. Related–check out the post 15 Websites And Apps You Can Use To Earn Gift Cards to find out how you can earn gift cards doing things you probably already do online. Use them to bless people who helped with your wedding. 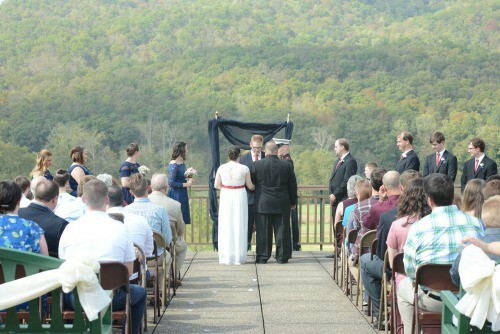 To throw a thrifty wedding you have to be open-minded and flexible. Remember: the day itself is not nearly as important as the life together that will follow. As you plan and budget, keep in mind that while it’s absolutely acceptable to have frivolous things–it is, after all, your WEDDING–it is not necessary to uphold every single wedding tradition or fulfill everyone else’s expectations. it’s YOUR day. Choose a few things that will mean the most to you and budget around that. Maybe you want a fancy venue that charges by the hour. Could you cut down on food by doing only cake? Maybe you don’t like cake? Search Pinterest for wedding cake alternatives (friends of mine used donuts!). My suggestion is that you spend the most money on a quality photographer. If you know a quality photographer who offers you a discount or a freebie–TAKE IT. You will cherish those photos. I certainly cherish mine. Who knows when I will get a picture with my great-grandmother again? 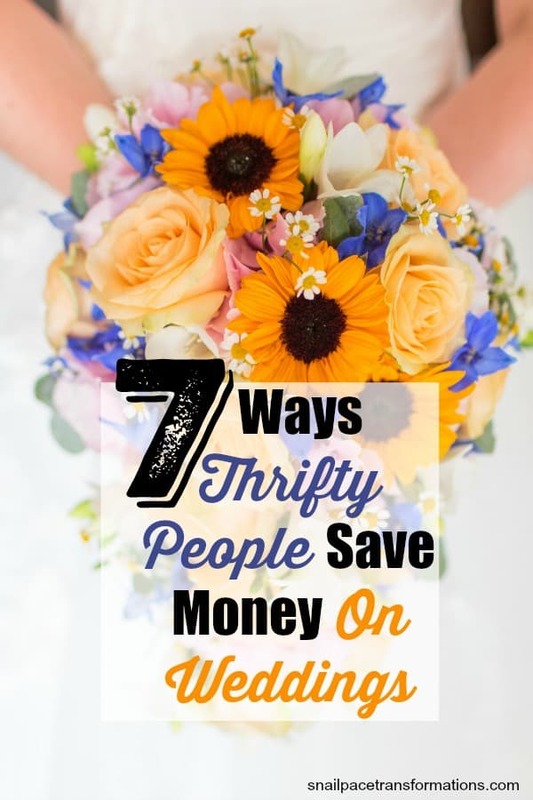 I hope this helps you plan a thrifty wedding! If you have questions or more suggestions, leave them in the comments below. I will watch them and see if anything I came across in my planning can help you! This guest post was written by Leah Simpkins, a 2017 college graduate. She is a Media Publication Assistant at a small college and freelances as a writer and editor. She is an avid reader and enjoys spending time with her husband.